Pregnancy can be a wonderful thing, but there’s no doubt it can be a little tougher during certain times of the year. For example, due to the symptoms produced, the hot summer months can make pregnancy a really uncomfortable experience. The good news is, if you’re set for a summer pregnancy, there are things you can do to keep yourself cool and comfortable throughout. 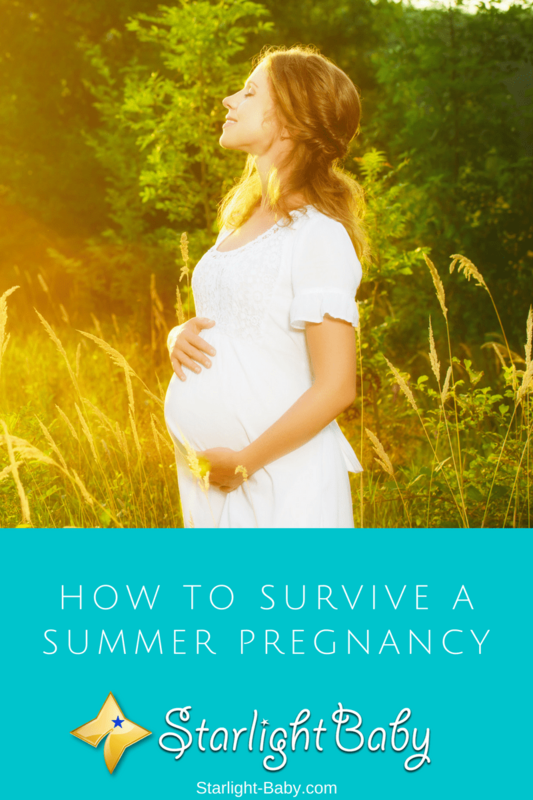 Below, you’ll discover some of the best ways to survive a summer pregnancy. One of the hardest things about a summer pregnancy is the heat. The hot, sticky weather can really leave you feeling miserable, not to mention super sweaty! However, there are ways to keep cool and experience a more comfortable summer. Firstly, you’ll want to make sure you’re drinking plenty of water. Keeping hydrated during pregnancy is important anyway, but it’s especially crucial in the hot summer weather. A good tip is to consider drinking sports drinks which contain electrolytes, as these help to replace fluid and salt which is lost when you sweat. You’ll also want to pay attention to the clothing you’re wearing. Invest in light colored summer maternity wear. That way, you’ll stay much cooler and you’ll also be less likely to develop unpleasant rashes caused by sweat. Darker colors are known to absorb the heat, so always stick to light colored clothing during the summer months. When it comes to venturing outdoors, you’ll want to avoid going out during peak times. Early mornings and early evenings are the best time to get any outdoor tasks completed. If the weather reaches more than 90 Degrees Fahrenheit, you’ll need to either stay indoors, or make sure you’re out in the shade. If you do start to feel too hot, a quick cool shower can really help. You’ll also find a spray bottle filled with water invaluable at keeping you cool and comfortable. Another issue you’ll have with a summer pregnancy is what it can do to your skin. While the hair may look and feel healthier than it ever has done, the same can’t always be said for pregnancy skin. In the summer months, the heat can cause big problems for sensitive skin, leading to problems such as dark patches and spots, heat rash and dry itchy skin. The melanin within the skin reacts to hormonal changes during pregnancy. This can lead to the development of dark patches and spots. It’s more common in women with darker skin or hair, and it can be prevented with sunscreen and avoiding excessive sunlight. Heat rash is especially common in pregnant women during the summer as it’s caused by a mixture of sweat and heat. It’s especially common just below the breasts and can prove to be really uncomfortable. It’s recommended you dry underneath the breasts thoroughly after having a shower and as recommended earlier, wear light, loose-fitting maternity clothes to allow the skin to breathe. Finally, dry and itchy skin may be most associated with the cold, winter months, but it can prove problematic in the summer too if you’re pregnant. This is because the skin is already dry due to it being stretched during pregnancy. The heat from the sun can then cause the skin to dry out even further. To prevent this, be sure to apply a lotion or moisturizer more frequently than you would in the winter. Edema is a common pregnancy symptom that’s bad enough to deal with at any time of year. However, it can be particularly unpleasant to deal with during summer. Causing the feet, ankles and calves to swell, Edema can make a summer pregnancy pretty miserable! There are ways you can minimize the swelling however. Keeping your feet elevated as much as possible once swelling does appear, can reduce it significantly. Massaging the legs can also really help, as can drinking a lot of water. There’s even some foods which are considered helpful at reducing the symptoms of Edema. These include watercress, citrus fruits, parsley and celery. Staying cool and comfortable throughout a summer pregnancy, often means you need to stay indoors a lot of the time. While this may be cooler, it can prove to be really boring too! Invest in some new books, watch old movies, take up a new indoor hobby or play games on your iPad. There’s plenty of unique, fun things you can do to relieve the boredom. You could also invite friends or family around to keep you company. After all, once baby arrives you’ll soon find yourself missing adult conversation. So, you may as well get as much of it as you can right now. Now, the last thing you’re going to feel like doing is exercising. However, regular exercise can actually help to ease some of the symptoms of pregnancy. You just need to be careful in the hot summer heat. One form of exercise you’ll definitely want to consider is swimming. Not only is swimming a great way to cool down in the heat, but it’s also really gentle on the body. Some pools even have set times reserved for pregnant women, so you should check out your local pool to see if they have this type of policy in place. Overall, a summer pregnancy doesn’t have to be uncomfortable. The above tips can help to make it much cooler, comfortable and enjoyable. If you are worried about your health, such as a skin condition which won’t clear up, it’s best to seek advice from the doctor. They’ll be able to prescribe pregnancy-safe medications if required. I know first hand the toll it takes on a pregnant mother to deliver during summer season. My first son was actually born such season of the year and it wasn’t an easy experience for my wife. Normally she sweat a lot and the pregnancy made issues worst. She had rashes all over her neck and back, we practically had to put the generator on all nights to help with making the house more comfortable. OMG! I am sure it was not only unbearable but horrible. Pregnant women are often uncomfortable, and rashes would have made things worse! I’m sure your wife was very much relieved when it was all over. Yeah, she was very relieved when it’s all over. Also I’m at peace too because her discomfort also affects me the same way, even though she is the suffering it directly, I’m suffering indirectly. Our baby doesn’t sleep well when the weather is hot and exposing him would make him vulnerable to catching cold flu. What can we do about that? When my wife found out she was pregnant, it was the month of August. In our country, It is still summer in August. When my wife delivered the baby in May, it was still summer. Between these two summers, a lot of things happened. It is common for us to cool ourselves with cold foods during summer, however, our experiences tell us that eating cold foods, ice creams, sherbets etc. is not good for a pregnant woman. Personally, I don’t like summer. I hate it because it makes people uncomfortable and hot-headed, haha. Some say cold foods are not good for pregnant women because they could make the baby really big/fat and makes the delivery process difficult. So eating cold food food isn’t good for a pregnant woman? I never knew about that before. But I’m sure taking cold water isn’t a problem as well because my wife use to drink a lot of it whenever she is pregnant. I’ve checked online for expert answers on this issue, and found various perspective. The most sensible explanation I’ve read says it doesn’t matter if a pregnant woman eats or drinks cold food or beverages/water because the substance is already at body temperature once it reaches the fetus. So based on this, it doesn’t really matter if a pregnant woman takes cold drinks and foods. I also consumed a lot of cold foods and beverages when I was then pregnant with my kids, and thankfully, they didn’t grow too large to make delivery difficult. Alright @Elsa, thanks for clearing that up for me because I got a little bit worried about that. But seeing that taking cold beverages didn’t affect you and your baby negatively, then I don’t have any need to still be worried. My mother used to tell me nightmare stories about her summer pregnancy, which was – coincidentally – the same pregnancy that gave birth to me! Summers in my country (Italy, by the way) are particularly hot, sweaty and generally unbearable especially in the south, which is where I used to live with my parents. Also, our family didn’t have access to air-conditioning because they weren’t exactly cheap, so that made it even more uncomfortable overall. I couldn’t imagine how you survived the heat without an airconditioning. I’m sure it was truly unbearable. We can only wish women could exactly plan when they want to get pregnant. Pregnancy in itself is unbearable, how much more if the weather is warm? Even a normal person feels some form of discomfort during the summer time talk more of a pregnant woman. I appreciate that the tips given in this article for it is going to things easier when applied women that get pregnant during the summer.